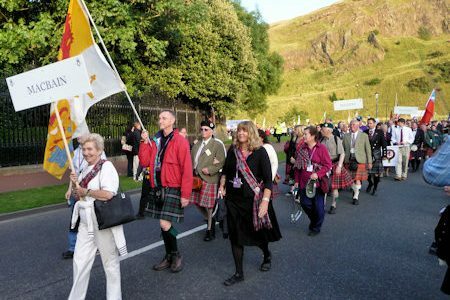 We were there at the largest Clan Gathering in the world—–In Scotland—where else? The Clan McBain (MacBean) was out in force in July at the Gathering of Clans, an event supported by the Standing Council of Scottish Chiefs. Over 100 recognized Chiefs attended along with their Clans and supporters. Initially our first destination was the Scottish Parliament were we were seated to discuss such topics as “The Clan System in the 21st Century” It was an all day affair with a break for a fire alarm in the building where we were escorted outside (in the rain) for the inspections and whatever cleanup had to be done. In the afternoon we had what was called a “breakout” session where I addressed the group on the importance of treating Clan membership as a family affair and that political boundaries (such as national boarders) had no place in our family history. The next two days were devoted to the Scottish Games which featured a greeting from Prince Charles thanking us for coming together. About 100 Clan tents spotted the grounds of Holyrood Palace arranged in more or less alphabetical order. The McBain tent was centrally located and was one of the nicest tents Peggy and I had ever used. A problem was that we had almost nothing to show in the tent. No tartan no books no exhibits. I did raise my personal flag over the tent. George Wiseman showed up the first morning and brought some Clan membership forms. Peggy and I manned the tent throughout the days and we had many visitors. Australia, Canada, New Zealand and most importantly Scotland and the UK they were happy to meet the Chief and the Lady of McBain. Edinburgh Castle. A sixty minute show was the climax to the event illustrating 800 years of the Clans History. Next to Inverness and the gatherings there, Loch Ness McBain Memorial Park, the Inverness celebrations and the march through town.